AIDS/LifeCycle is a fully-supported, seven-day bike ride from San Francisco to Los Angeles. It’s a life-changing ride—not a race—through some of California’s most beautiful countryside. AIDS/LifeCycle is co-produced by the Los Angeles LGBT Centerand San Francisco AIDS Foundation and is designed to advance their shared interest to reduce new HIV infections and improve the quality of life for people living with HIV/AIDS. As part of this event, thousands of people raise critically needed funds for HIV/AIDS-related services and bring to light the fact that HIV/AIDS is still a devastating disease in our society. Over the course of 7 months, verynice worked with AIDS/LifeCycle to build the new campaign brand for the next 2-3 years. A brand is more than just a logo. We worked with AIDS/LifeCycle to develop their Ride’s brand positioning, name, brand messaging and voice, identity, typography, colors, secondary elements, and campaign assets, (i.e. collateral, shareables, swag), that involved copywriting and design. A thorough strategy process was implemented to identify the goals, values, and positioning for the campaign. We wanted to be able to honor the history of the ride, while updating the campaign brand as a rallying cry for additional participation and support. With those goals in mind, we were then able to really explore what 5 key brand metaphors could best convey the passion and life-changing energy of the ride to new riders and returning riders alike. Conducting this research collaboratively with members of the Los Angeles LGBT Center and San Francisco AIDS Foundation was vital for the development of a creative brief. Together we were able to come up with criteria for the new campaign, joking that the new brand must be “tattoo-worthy” since many riders had tattooed past campaigns. While the goals and core values allowed use to diverge, coming up with nearly 100 different campaign ideas, the criteria helped us converge on 5 main concepts capable of executing the intended goals. These concepts were explored through light visual direction and the creation of mood boards, which are a collection of words and images that help illustrate the world that the brand will live in. Although there were various options representative of the campaign’s brand goals, “Ride Love Live” was selected as the campaign theme. Following a well informed concept, the visual design goes through a series of explorations before reaching the final product. Exploration can include sketches, digital designs, color, imagery, and even initial messaging. Through a collaborative feedback loop with our clients, iterations can combine ideas or hone in on the ones that resonate and further explore style, typography, composition and color, while refining the brand concept. Developing the personality of the brand through visual communication includes logos, color palette, typography and secondary elements. For The Ride Love Live campaign, our challenge was to create a visual system that is distinct and exciting for the Ride, but can live within the AIDS/Lifecycle brand for years to come. With distinct shape, custom illustrations, and bold weight, this campaign design is reminiscent of band or club artwork, something you’d want to rock on the back of your jacket. The logo uses a unique custom typeface, heavy linear design, with consistent weight to the stems giving the illusion of motion around the wheel of a bicycle. A warm color palette utilizes the AIDS/LifeCycle orange and complementing shades of gray along with a screen printed texture. These elements combined capture the vibrant, iconic, powerful, and welcoming energy of the AIDS/LifeCycle community. "Our team was incredibly impressed with the way that verynice guided us through the creative process and helped us discover and create a campaign that everyone is excited to be a prat of. The scale of the project was made possible by their non-profit friendly business model, but it’s truly the people and process where verynice shines." Along with creating a ready-to-use package of brand elements, we created a writing guide and a comprehensive style guideline to ensure consistency across platforms. This type of documentation creates a legacy for the brand, so that other designers, developers, copywriters, and stakeholders can continue creating branded materials for their initiatives long after our engagement without compromising on quality. Brand guidelines include color codes, typographic hierarchy, secondary element usage guidelines, imagery usage guidelines, sub-programming and co-branding guidelines, logo use-case scenarios, and do’s and don’ts for the assets. 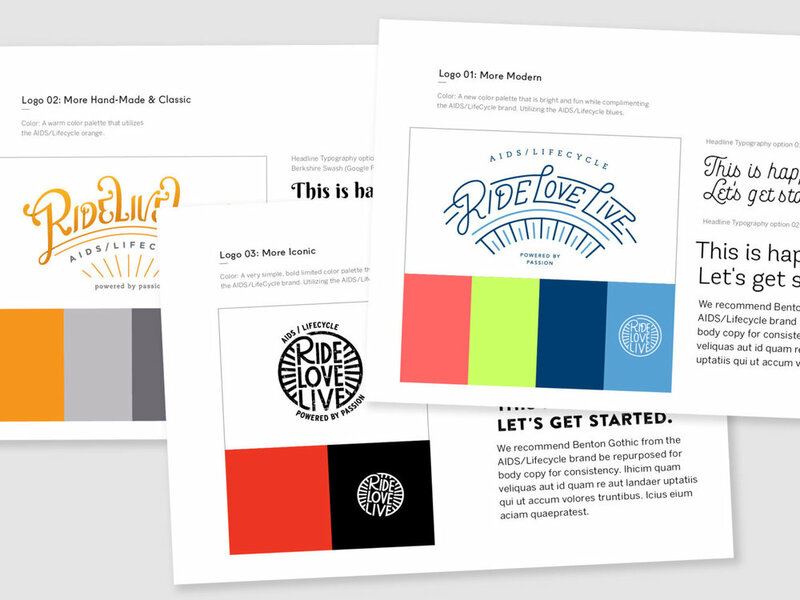 The Ride Love Live brand includes custom icons that symbolize the campaign concepts, and celebrate riders, roadies, and more. These, along with a screen printed texture, are added to brand applications. A messaging guide serves as a blueprint for the brand voice, which can be used for all messaging, copywriting, and content generation for future materials. This includes overall goals, a guide for personality, vocabulary, and communication to different types of stakeholders, sample content, and general success criteria. These new brand and messaging guidelines allowed us to expand the application of the brand into additional materials for the ride. Applications included a cycling cap, jersey, vest, t-shirts, digital and printed promotional graphics, a welcome toolkit, and more. 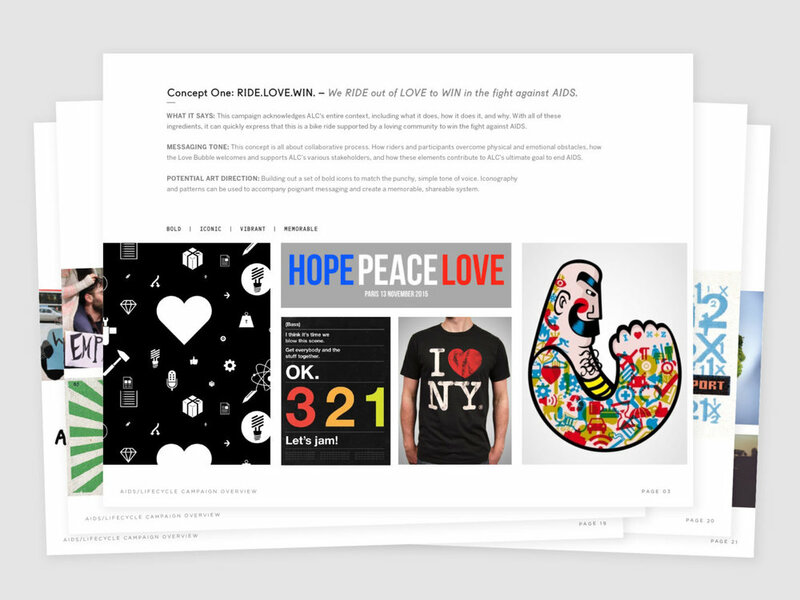 We also created a number of templates for the AIDS/Lifecycle team to use, paying close attention to the organization’s needs and use-cases, we were able to determine a range of styles for different applications and audiences in the future. We were thrilled to have the opportunity to work with such a vibrant group to create a brand with just as much personality as the team’s. Can’t imagine a more fun group of people to go on a 545-mile bike ride with! For more information, and to do something amazing this year, check them out at https://www.aidslifecycle.org/.